For quantitative determination of calcium ion Ca2+ and evaluation of drug effects on calcium metabolism. CALCIUM is measured to monitor diseases of the bone or calcium regulation disorders. Increased calcium levels in serum are reported in hyperparathyroidism, metastatic bone lesions and hypervitaminosis, while decreased levels are observed in hypoparathyroidism, nephrosis, rickets, steatorrhea, nephritis and calcium-losing syndromes. Urinary calcium levels aid the clinician in understanding how the kidneys handle calcium in certain diseases of the parathyroid gland. Urinary calcium levels are also essential in the medical evaluation of kidney stones. Simple, direct and automation-ready procedures for measuring calcium concentration in biological samples are becoming popular in Research and Drug Discovery. BioAssay Systems’ calcium assay kit is designed to measure calcium directly in biological samples without any pretreatment. A phenolsulphonephthalein dye in the kit forms a very stable blue colored complex specifically with free calcium. The intensity of the color, measured at 612 nm, is directly proportional to the calcium concentration in the sample. The optimized formulation minimizes any interference by substances such as magnesium, lipid, protein and bilirubin. Applications For quantitative determination of calcium ion Ca2+ and evaluation of drug effects on calcium metabolism. 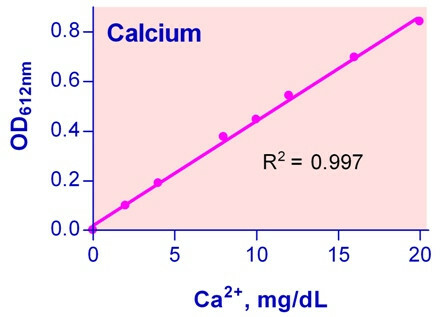 References Assay: Calcium in Cow Serum (Pubmed).